I often feel like this, but I think that this is one of my favourite things I've ever made! I love everything about it - the pattern, the style, the fabric... The fabric is from Frou - Frou, a wonderful Parisian fabric shop. You can find a review of it here, where I've posted about the fabrics that I bought. One of the things that I'm most proud of in this garment is the fact that I drafted the pattern myself. While I love the endless array of dressmaking patterns that there are, sometimes only you can draw up exactly what's in your mind. This is one of the reasons I love pattern hacks. For this top, I designed the pattern myself. Not only does it fit well, but it is exactly what I dreamed of and it feels like a great achievement for me! The construction of the blouse included both challenging and simple techniques. I decided to make a toile first, as I made the pattern up slightly as I went along. The toile enabled me to change the seam allowances slightly, add a seam in the centre back, and make the top slightly longer. 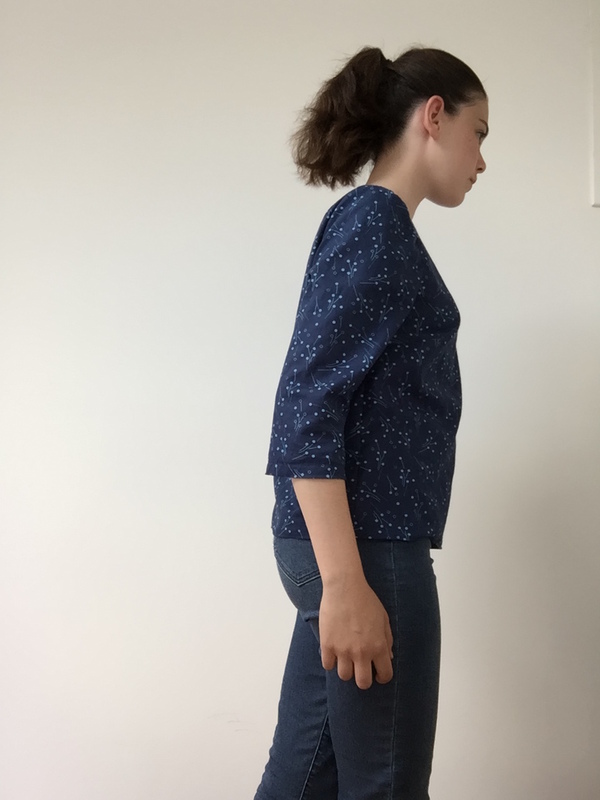 I really love the proportions of this top, from the slightly cropped hemline to the 3/4 length sleeves. Onto the best part... the zip! I absolutely love navy and mustard together, and as soon as I saw the zip I knew it would be perfect. 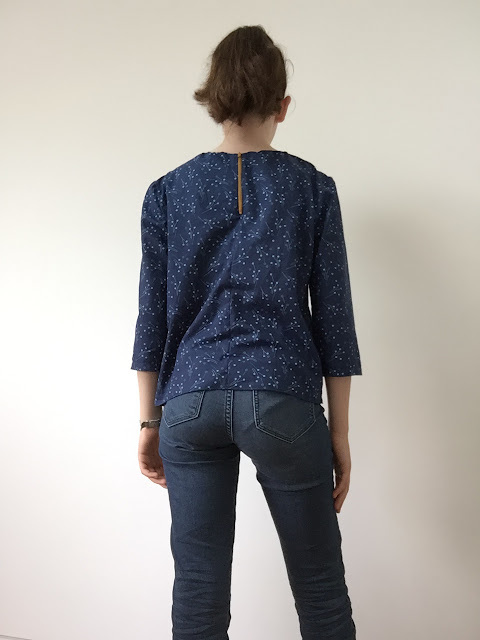 I also have some mustard denim which I'd like to make into a skirt to go with this top... On my toile, I didn't put a seam in the back, and used these instructions to create an exposed zipper. However, despite the fact that I'd sewn one before, I wasn't fully happy with how neatly it went in. I decided to add the seam in the back to make it neater, and also slightly easier to sew. One of the things that I love in garments are the details both inside and out. The neckline in this top is finished with a facing, which I absolutely love. Facings along zips aren't the easiest things to sew, but once you've done several they become much easier, and I love how neat it looks inside. You can see a better view of the back of the top here. I love that zip! 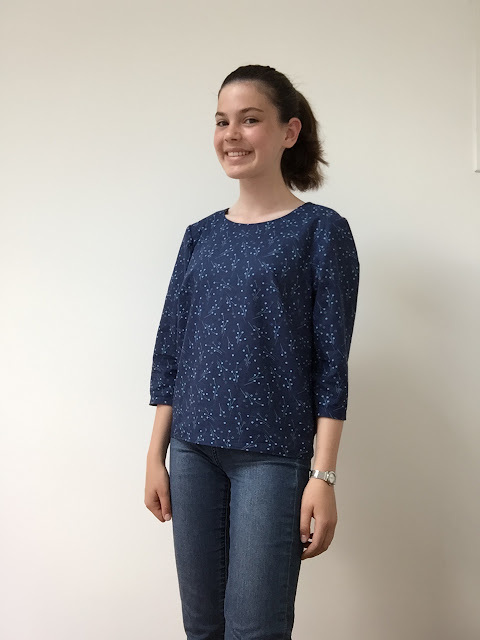 This top was a delight to sew, I love the style and am already planning more (including a similar one for my mum!). It's when you create something like this that you know exactly why you sew - no ready to wear shop could sell something that is so me. I'd say a little bit of following instructions from other patterns I've made an a little bit of making it up! Thank you. Your top looks awesome - well done on drafting it yourself! And that mustard zip is really cute too, it's so nice to be able to add details like this that are a little different! This is gorgeous! I love mustard and navy together too. I like the 3/4 length sleeves on this, I bet you get loads of wear out of it! Thank you! Yes I've worn it a lot.